REPORTING FROM DENVER — A popular concert series at the Denver Botanic Gardens faced its biggest hurdle in its 30-year history after a group of nearby neighbors got vocal about noise issues at the summertime event. But a combination of acoustic engineering and clever booking made it possible to save the 13-concert series and keep the peace in Denver’s Cheesman Park. Next, Swallow Hill hired Production Services International (PSI), a Denver-based turnkey production house, to manage all staging and production of the summer concert series. Together, Swallow Hill, the Denver Botanic Gardens, and PSI were able to resolve the sound issues by installing an L-Acoustics V-DOSC sound system and angling the speakers down into the amphitheater’s bowl to better contain the sound. The 55-decibels restriction applied to the nearest neighboring lots, and series organizers have figured out that this means 85 decibels is the loudest artists can perform at from the front of the house in order to remain compliant. David Weingarden, director of concerts and talent buyer for Swallow Hill, said that mitigating the sound issue has been a huge relief to all organizations involved, and since installing the new system, they’ve had zero complaints from the neighbors. James Cutler, production manager and senior account executive for PSI, said resolving the noise ordinance problem was a combination of multiple approaches. This year’s acts include Sharon Jones and the Dap Kings, Chris Isak, India.Arie & Idan Raichel, Rosanne Cash with Nina Storey, Keb’ Mo’, and k.d. lang and The Siss Boom, with legendary blues guitarist and singer-songwriter B.B. King wrapping up the 2011 series. Ticket prices range from $50 to $80, and the series is partially underwritten by members and membership fees. The Denver Botanic Gardens is staging all performances at its 2,500-seat UMB Bank Amphitheater at its York Street property, with the exception of one show—Bruce Hornsby & the Noisemakers and Béla Fleck & the Flecktones—which will be held at the Gardens’ 5,000-seat Chatfield Green venue. Although the new acoustics system was a major element in controlling the volume, Cutler said installing the speakers in a line array system with a dispersion pattern of 8 degrees (so they’re able to aim the sound to where the pattern stops at the top of the hill and contain it to the bowl), was necessary to keep the neighbors happy and avoid any sound complaints. However, Cutler said, the subwoofers are hard to contain and they don’t really have control over the artists’ stage volume, which is why a strong rapport and upfront discussions with the stage team is so crucial. Another measure they took to control the volume was moving the sound engineering booth into the bowl so the sound engineers can get a better idea of how to control the volume during performances. "We did such a good job for the Gardens that we’ve become their exclusive AV provider,” Cutler said, adding that PSI is also currently in negotiations with Swallow Hill to wrap up the remainder of its five-year contract as the partner for the Botanic Gardens’ summer concert series. In addition to the noise ordinance issue, Weingarden said there are some other logistical challenges with staging and production associated with the layout and accessibility of the venue. Booking can also be trying, Weingarden said, as it is somewhat of a puzzle working around the Gardens’ other events like weddings and fundraisers. 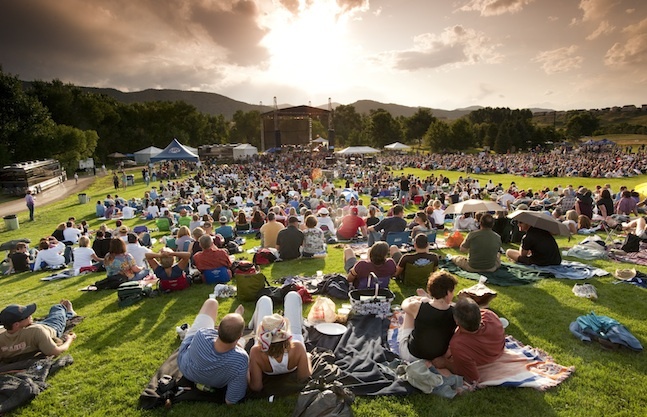 Plus there is a lot of competition in Colorado, which is home to a multitude of venues and hosts dozens of festivals and free concerts in the summer. But, he said, the Botanic Gardens’ series has a strong reputation and a long-standing history with its members and Denver locals who heavily support the organization.